This week’s Top Ten Tuesday, hosted by That Artsy Reader Girl is about all things audio. Although I am fairly new to the podcast scene (just became an avid listener about a year ago), I thought it only fitting to share with you eight of my favorite episodes from some of my favorite podcasts. For the unfamiliar, a podcast is a digital audio file, made available on the internet for downloading (or streaming). It is typically available as a series, with new installments which can be received by subscribers automatically (as defined by Google). If you, like me, are fairly new the podcast movement, I recommend finding a podcast player or app (Samsung has one; so does Apple). What’s great about the apps are that they also offer recommendations based on topics, which may allow you (like me) to stumble across some gems you might not otherwise have discovered. As I have explored the podcast universe (it is expansive; you are likely able to find something on every topic under the sun) I have noticed about my own podcast preferences is that I am into nerdy topics interested in people — their stories, their motivations, their successes (and failures) and how they became who they are. But I didn’t go immediately to these podcasts. In fact, I have listened to quite a few duds, even by podcasters that other people swear by. My advice, though, is that if you want to get into podcasts and aren’t sure where to start, my advice is to just get listening. You’ll find soon enough what you like and don’t like. And every time I watch or listen to this podcast, I have the same thought: Art is Magic. As a magician myself, though of the paper and pen kind as opposed to the cards and top hat variety, I strive to approach my craft with the same level of devotion as Blaine. Fact: My husband says he is tired of hearing the Josh and Chuck’s voices. That’s how often I listen to the Stuff You Should Know podcast. But also fact: My husband listens along to them even though he pretends he isn’t. He slipped recently and referenced some knowledge dropped during an episode I listened to in our kithen while he supposedly worked on beats in the living room — so how did he hear?! Anyway, I do not remember how I found this podcast — maybe through a Google search. But I am so glad I did. Josh and Chuck probably have thousands of episodes that range from their 15 minute-ish Short Stuff You Should Know to hour-plus long, more extensive coverages. They’ve been producing episodes since 2008 and still have not ran out of stuff we should know! This episode, hosted live from Seattle in October 2017, was one of the first I ever heard (though I listened several months later). A former binger of the Fox series Prison Break, I’d heard of DB Cooper — but did not know the DB Cooper or his heist, which is one of the “greatest unsolved crimes” in the United States. The amount of research Chuck and Josh put into an episode is mind-blowing. I enjoy hopping into their Way Back Machine to travel with them back in time, and they have mastered the telling of their stories in chronological order. They provide the facts they can find, the rumors, and their own thoughts, jokes, and banter as they go, which makes for great edu-tainment! Now, here is a confession that may shock some: my only real reference point for Prince was the Charlie Murphy’s True Hollywood Story skit on The Chappelle Show, which I first watched six years after the series ended. I mean, I knew vague things — like “Purple Rain” or that he had once changed his name to a symbol. One of my college professors actually went to high school with him, so I also knew he played basketball. But could I readily sing a song? No (please allow me to hold the moment in this non-judgmental space). I did not really know his work ethic. Or his passion to his craft. How he inspired others around him. How he transformed Harriette’s own life. What I really like this episode, and the DreamLeapers… series as a whole, is how I end each episode in wonder. It is interesting to learn about the unique ways people (even Harriette) have found their success. Every time I tune in, I experience, as Harriette says at the start of each episode, an hour spent “dreaming about how we want to live our lives and how we can access and activate our dreams.” When the show ends, I am left with a week to consider new ways to think outside the box. I am curious to know how many brand names we encounter in a day. Probably hundreds (can someone direct me to a study?). We are a consumer nation. And yet, as we interact with all of these brands (whether using the product or viewing the ad), how often do we think about about the people who actually create them — or the story of how it became popular? Hardly ever, right? Take Jeff Bezos of Amazon, who has been somewhat of a weekly item in the news for who knows how long. Only recently did I give him and the Amazon story a deeper thought after someone tweeted an image of him from 1999 in a cramped office with an airbrushed Amazon banner tacked to the wall. Making bags was so left field an idea for her that her own family didn’t take her seriously. For a Mother’s Day gift during the early days of kate spade, her sister actually suggested they give her mother a Gucci bag. 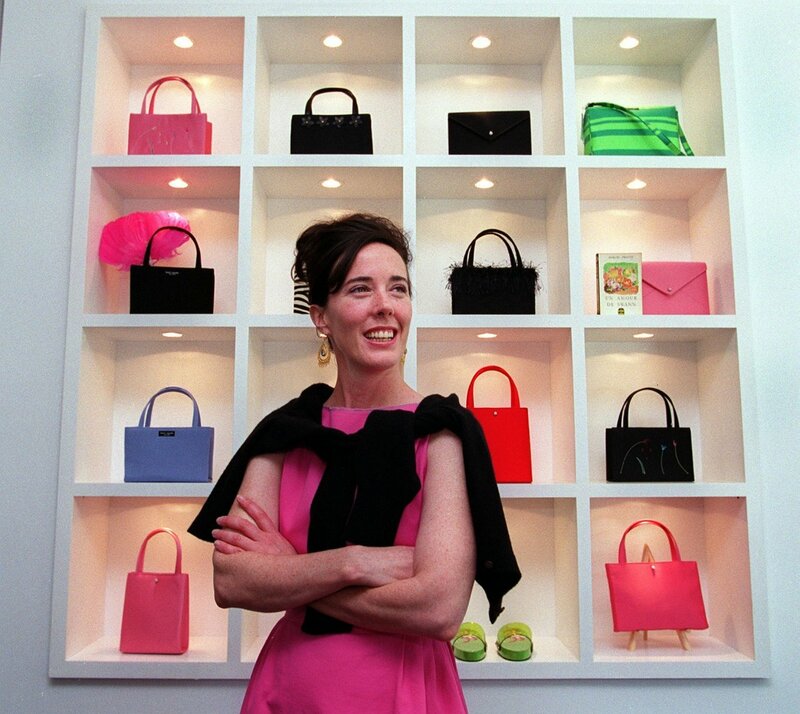 To her family, and some of her friends, kate spade was just a hobby, a project that shouldn’t be taken seriously. No one expected her new business to amount to much. But to . And the story is phenomenal. A Lyft driver recently asked what tribe I was from — he said my frohawk and skin made me look Fulani. I wanted to say, “I’m not African but I am a foolish goat,” but knew he wouldn’t get the reference to this hilariously relevant podcast hosted by Luvvie Ajayi (author of I’m Judging You) and Yvonne Orji (aka Molly from Insecure). Here is the podcast for today’s black young adult Christian woman. You may be thinking: “I’m not Nigerian,” or “What is jollof” or even “I don’t believe in Jesus” and think “This podcast is clearly not for me.” WRONG. If you are a millennial struggling to navigate this rugged terrain of life called Adulting, this podcast is for you! They talk about everything and each episode is feels like SistahGirl Talk. When I tune in, I feel like we are on a three-way call, just catching up. See? Can I get a Hallelu? Another episode of How I Built This must make the list because it utterly astounded me. When big ideas become successful, my assumption was because they were ideas that were thought out for years in advance. They are ideas that people have always wanted to accomplish. That the creators spent years learning, grinding, striving to make their dream a reality. This episode taught me that isn’t the narrative for every successful story. Sometimes, success can really a fluke, a chain of somewhat random events that, with the faith of the doers, happen to work out right. Ben and Jerry were middle and high school classmates who happened to reconnect after college. They eventually decided to make a food company. They only settled on ice cream because they didn’t have enough money to purchase bagel equipment. Then there’s the story of their business plan. Do not get me wrong. They did study how to run a business. They talked about their goals with the company and so forth. But when they began considering expanding their business, they pretty much plagiarized existing successful business plans — replacing the company name in the plan with their own. Maybe that’s all there really is to success. In high school, I had a friend who tuned into Oprah faithfully every day. Though I attended a journalism magnet program and was even voted Most Likely To Host a TV Show in my senior yearbook, I thought that was weird. I could not get into Oprah the show (though I loved O the magazine). She was such a success that I could not see her as a real person. She was this media entity, akin to an empress. And I was the resistant serf, refusing to bow down before her. When I heard Oprah, I heard Dane Cook’s mocking: Everybody gets a humped BACK WHAAAALE. YOU get a whale. YOU get a whale. And then, there was this podcast. Everything that I thought I knew about Oprah’s rise to success was shattered. And suddenly, she was human. A real person, who didn’t start out wanting to own an empire. This inside look at her career would also reveal the darker side to some of her sunniest moments — for example, the backlash she received from many of the infamous brand new car recipients, who suddenly had to report and account for the gift on their taxes. The series includes interviews with many of Oprah’s coworkers across the years, and even Oprah herself. It’s filled with snippets from actual audition tapes and episodes. Well researched, it is an audio documentary that works well by telling an amazing story. In the series, Sarah Koenig talked to any she can about the case. She even discovers details that weren’t previously explored by the police. I found myself binge-listening to this series. As the story unfolded, I could not pull my earbuds away. Like Koenig, I needed to know what happened, how the story unfolded the way it did. Does the series end with a definitive answer, a neat solution to the previously solved murder? You’ll have to decide for yourself. So what are some podcasts you are listening to? Share below and I will check out! Previous postBook Review – How Scary is Pet Sematary? Dream Leapers with Harriett Cole sounds like such an interesting and informative podcast. Great list. I’ve heard such good things about Serial but I have yet to check it out. I was utterly fascinated by the amount of research the journalist did for Serial. Impressive. It also challenged me to think critically about our judicial system.